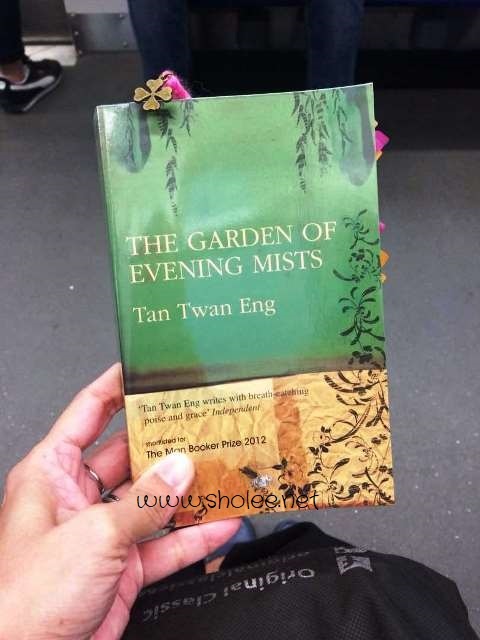 This book is about Judge Teoh Yun Ling, how her life has changed from the moment she was captured as a prisoner by the Japanese to the times when she was an apprentice under a famous Japanese gardener. Her life in general from Penang with her family to Cameron Highlands with her family's friends. Her law career in Kuala Lumpur was short-lived once she was diagnosed with an illness and finally her return to Yugiri (Evening Mists) to settle everything before she starts to forget. It was heart-wrenching reading Yun Ling's suffering at the Japanese camp, how her sister, Yun Hong, had endured just to make sure Yun Ling survived and escaped. The brutality of the Japanese army then was clearly described, so inhumane as though the prisoners captured are not humans at all! Yun Ling's desire to create a Japanese garden in memory of her sister had led her to Aritomo, a famous Japanese gardener. It's not an easy feat having to be apprenticed by another Japanese and in the end, being in a relationship with him. Frederik, her close family friend, was clearly in love with Yun Ling from the start but could not win her heart and losing to Aritomo instead. However, Frederik has always stand by her side, through thick and thin until the very end. Tan Twan Eng has done it again! The Gift of Rain was a mesmerising read! The Garden of Evening Mists is also awesome in it's own way! I've truly enjoyed it from the start, so relatable since it's set in Malaysia and easily absorbed with the straight-forward, beautiful prose. With the many detailed and descriptive settings, it shows the in-depth and thorough research he has made for this book especially during the Communist Malayan Emergency. Though some facts were intertwined with fiction, it's interesting how he had borrowed from those incidents to complete this book. I've learnt more of Japanese tattoo's history, even more so about 'borrowed scenery' and bird's nest! Not forgetting the fact that even racism was detected way back then. The few names mentioned made the book even more realistic like Han Suyin, William Holden, Ah Huat's Kopitiam and Jim Thompson! I have always admired Japanese culture, fashion and fads from way back then. Having known their cruel history, it does not change my preference as those are in the past. We can't just overlooked their talents all because of their cruel ancestors. They have come a long way, repenting with regrets of the past and moving forward to a more unified world. Overall, it's a book I've enjoyed so much and wondered many a times on why the author picked the Japanese Occupation timeline for both of his books. "Aritomo-sensei was more than the Emperor's gardener." Tatsuji shapes the knot of his tie with his thumb. "He was also a horoshi, a tattoo artist." "Malaya, Malaya," Hamid grumbled. "None of you find it strange that what you English so carelessly named 'Malaya' - my tanah-air, my home - didn't officially exist until only recently?" "This is my home too, Enchik Hamid," I said. "You orang China, you're all descendants of immigrants," Hamid retorted. "Your loyalty will always lie with China." "Now lies the earth night-long and washed in the dark silent grace of the rain"
It is right that Yun Hong will be remembered as I gradually forget and, in time, become forgotten. Flotsam - the wreckage of a ship or its cargo found floating on or washed up by the sea. Holbol gable - Cape Dutch architecture. Blerrie - bloody in South Africa English. Felicitations - words expressing praise for an achievement or good wishes on a special occasion. Tonsured - a part of the monk's or priest's head left bare on top by shaving off the hair.